Today, worldwide more than 6,000 employees are working on this permanent challenge at over 90 locations on all continents. Bruker systems cover a broad spectrum of applications in all fields of research and development and are used in all industrial production processes for the purpose of ensuring quality and process reliability. Bruker continues to build upon its extensive range of products and solutions, its broad base of installed systems and a strong reputation among its customers. Being one of the world’s leading analytical instrumentation companies, Bruker is strongly committed to further fully meet its customers’ needs as well as to continue to develop state-of-the-art technologies and innovative solutions for today’s analytical questions. Customs facilities represent a strategic traffic chokepoint at the entry to any country. These facilities provide the first defence against the trafficking of illicit substances via both passenger and commercial channels. In many cases customs facilities are based in huge warehouses containing many thousands of packages or can be based at the side of shipping docks, which accommodate the largest of ocean-going vessels. For passenger traffic, customs facilities normally located at the port or airport of entry. In conjunction with x-ray technology, potentially coupled with intelligence information a wide range of packages need to be checked for illicit materials. These can range from simple padded bags all the way through to shipping containers. For passenger traffic individuals are chosen based on intelligence information, behavioural monitoring, and in some cases, random selection. Preventing the importation of drugs/narcotics is an important strategy within most countries Customs facilities. In all cases the presence of drugs/narcotics can be detected quickly by a trace narcotics detector. These detectors can operate in a vapour mode sampling the vapour given off from a material of interest. Alternatively, to minimise the need to open sealed items or to damage “objets d’art”, trace detection measurements can be made on a non-scratch swab that has been rubbed on the suspect item. This swab is then placed into the DE-tector. It then informs the operator by means of a traffic light system whether an illicit substance has been found. Green means nothing has been detected, but red means the presence of an illicit material has been discovered. Text associated with the discovery shows the name of the drug that has been discovered and the necessary legal action can then be taken with the specific item, its exporter or its importer. The Bruker RoadRunner is a hand-held, battery-operated portable device that can be used both to check for explosives in a vapour mode, or can be used in trace detection mode using the swab that is rubbed on the suspect item. Traffic light symbols are used on the display to indicate what has been discovered in the process. Green means nothing has been detected, but red means the presence of an illicit material has been discovered. Text associated with the discovery shows the name of the drug that has been discovered and the necessary legal action can then be taken with the specific item, its exporter or its importer. Pop concerts represent a microcosm of the population who set out with one goal; to enjoy themselves. Regrettably, these types of major events often attract people with a different goal; to sell and to distribute drugs or narcotics. Where intelligence information suggests that drugs or narcotics might be on site, people and their belongings can be checked for traces of drugs quickly and easily. Personal property can be swabbed to determine if any drug traces are present, and this includes items like mobile phones, cameras and hand baggage. Alternatively, a detection system that detects the volatile vapours of narcotics such as methamphetamine can be readily used to make a quick check for the presence of drugs in bags, pockets and clothing. 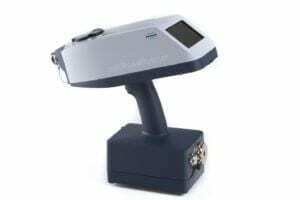 The Bruker RoadRunner is a hand-held, battery-operated portable device that can be used both to check for explosives in a vapour mode, or can be used in trace detection mode using the swab that is rubbed on the personal property of the chosen visitor. Traffic light symbols are used on the display to indicate what has been discovered in the process. Green means nothing has been detected, but red means the presence of an illicit material has been discovered. Text associated with the discovery shows the name of the drug that has been discovered and the necessary action can then be taken with the specific visitor. The Bruker DE-tector is a combined drugs and explosives trace detector that is simple and quick to use. A reusable swab is rubbed on the personal property of visitors, and this swab is inserted into the detector device. The system then informs the operator by means of a traffic light system whether or not an illicit substance has been found. Green means nothing has been detected, but red means the presence of an illicit material has been discovered. Text associated with the discovery shows the name of the drug that has been discovered and the necessary action can then be taken with the specific visitor. International regulations require that passengers who intend to board an aircraft are randomly tested for the presence of trace explosives. The science of trace explosives detection is well established and is based on the fact that if a person handles explosives, even though they may wash their hands afterwards, minute traces of explosive will still remain. These traces can be passed on readily to their personal belongings, which can include mobile phones, laptops, keyboards, laptop bags and various other items of baggage. In most countries, the desire to protect civil liberties tends to prohibit the most obvious source of trace explosives; the hands and skin. The Bruker DE-tector is a bench-top system that detects traces of both drugs (narcotics) and explosives. It plays a key role in both air passenger security screening where it is found in combination with hand baggage X-ray systems. Additionally, it plays a key role in Access Security Control where it is used at the entrances of critical infrastructure installations to identify personnel that might have been in contact with explosives materials; even HMEs (Home Made Explosives). The DE-tector is a fast trace explosives detector, which is simple to use. Samples are taken from suspect’s personal property by means of a reusable polymer-based glass-fibre reinforced swab, and the swab simply inserted into the detection instrument. The measurement is made and the operator advised of the findings by means of “traffic light” symbols. Green means clear, and red indicates a positive detection. The Bruker RoadRunner – a battery-portable, hand-held, version of this technology that affords a greater degree of transportability; literally a “go anywhere” device. Just like the bench-top DE-tector, this technology will detect traces of both drugs and explosives. The hand-portable System helps users in major facilities to improve their productivity as the device can be carried round with them and suspicious packages tested at will. This lightweight system weighs less than 3,5Kg and features hot-swappable batteries for extended deployments. Prisons and remand centres are encouraged by government to minimise the potential ingress of drugs narcotics. In many such facilities, the threat from illicit materials being thrown over the perimeter wall has been largely mitigated with increased perimeter patrols and fence-line monitoring techniques. The majority of drugs narcotics, discovered in prisons and remand centres, are largely illegally imported by visitors to the inmates. Based on either intelligence information, behavioural monitoring or by random selection, visitors to such centres can be screened to detect whether they have been in contact with drugs narcotics. This is achieved by the use of sample swabs or vapour detection techniques. The Bruker DE-tector is a combined drugs and explosives trace detector that is simple and quick to use. A reusable swab is rubbed on the personal property of visitors, and this swab is inserted into the detector device. The system informs the operator by means of a traffic light system whether or not an illicit substance has been found. Green means nothing has been detected, but red means the presence of an illicit material has been discovered. Text associated with the discovery shows the name of the drug that has been discovered and the necessary action can then be taken with the specific visitor. The term “Critical Infrastructure” refers to the basic backbone of a functioning society’s economy. Examples include facilities and services associated with power, oil, tele-communications, agriculture, water and sewerage, public health and transportation. However, to protect Critical Infrastructure fully, we need to consider the human aspect. This includes the people that work in these facilities and in many cases, the customers or users that rely on this infrastructure. DE-tector is the latest drugs and explosives trace detection system with a unique twin tube IMS design enabling parallel detection of narcotics and explosives and a false alarm rate at almost zero. 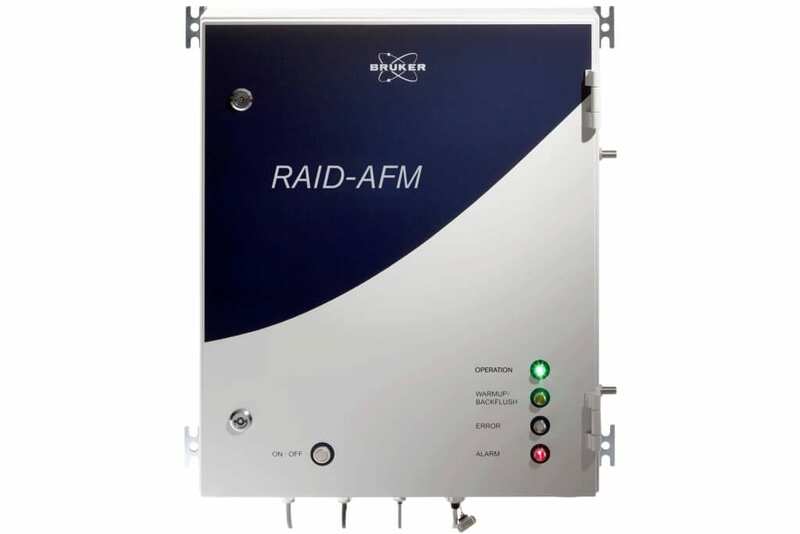 Brukers RAID-AFM is a Rapid Alarm and Identification Device that utilises trusted IMS technology that can run continuously without operator intervention. It is generally agreed that one of the most obvious methods of taking an illicit explosive device onto a passenger aircraft is via hand baggage, articles of clothing and in some extreme cases by virtue of “body bombs”. However, for maximum security, the detection processes applied to passengers should be applied equally to the ground staff, ground crew and other maintenance operators who enter the airport via the various airside access points. As with passengers, these personnel should be tested regularly for the presence of trace explosives on the property clothing which accompanies them. As with passengers, people can be chosen at random or may be chosen based on both gathered intelligence, which can be based on behaviour monitoring techniques, and/or the discovery of the presence of suspicious materials in articles they are taking on site. 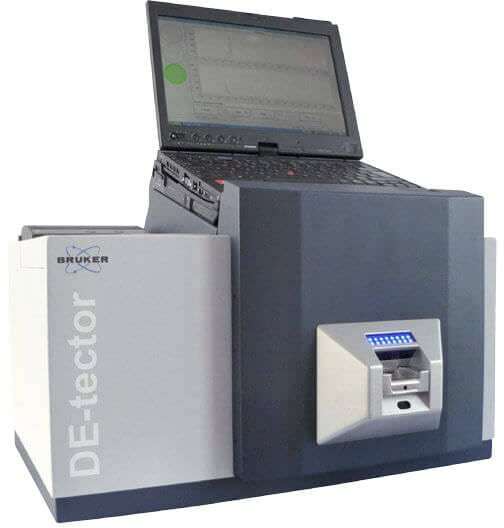 The Bruker DE-tector is a fast trace explosives detector, which is simple to use. Samples are taken from suspect’s personal property by means of a reusable polymer-based glass-fibre reinforced swab, and the swab simply inserted into the detection instrument. The measurement is made and the operator advised of the findings by means of “traffic light” symbols. Green means clear, and red indicates a positive detection. The Bruker RoadRunner is a lightweight portable trace explosives detector, which is quick and simple to use. Samples are either taken from a package by allowing the instrument to draw the vapour in that package into its measurement system. Samples can also be taken by the standard swab technique, and the swab inserted into the instrument. As with DE-tector, Roadrunner also uses traffic light symbols to inform the operator of the measurement status. Bruker is the acknowledged world leader in the design, development, configuration and supply of detection technologies for surface vessels. Choose from the capabilities below to defend both your most valuable naval assets and their crew complement. Protecting the citadel occupants by detecting all known chemical warefare agents, the RAID-S2 detector is configurable to meet your needs. For example, by detecting breakthrough in the CBRN filter system, this product gives early warning of a toxic threat inside the citadel. The IT module of the Naval NC-detection system collects and manages the relevant sensor data, facilitates the operation of the sensor system, and provides an interface to the ship management system. The Bruker Radiation Probe is a gamma dose-rate detector that mounts to the superstructure and has IP66 protection. This detector outputs data over RS422 and can be integrated directly to the ship’s IT system. Bruker Detection products have been installed successfully in major warships around the globe; protecting both the vessel and crew. In addition to a range of chemical detection systems, Bruker also offers on-line biological agent detection systems, radiation detectors and trace explosives detection. All our products are designed to help you protect people and property. The Bruker Submarine Nuclear and Chemical Detection System (SNCDS) is a highly-specialised, stationary system for the detection of nuclear radiation and chemical agents, which has been specifically designed for the demanding environment of submarine installations. It comprises a chemical agent warning system based on the Bruker RAID-U2plus, two radiation probes and further components and accessories. The chemical Agent warning system operates through a snorkel system that has been extensively proven on multiple submarine installations. 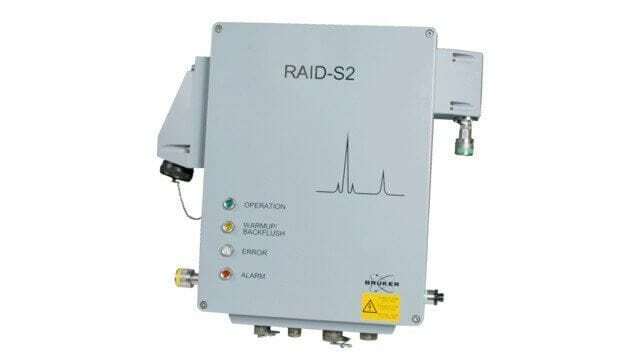 The RAID-U2plus is used for detecting Chemical Warfare Agents (CWA) and Toxic Industrial Chemicals (TIC) in the atmosphere outside the submarine. The system is integrated to the boat using a bespoke sampling system designed exclusively for submarine applications. When the vessel first surfaces, atmosphere samples are drawn in via a telescopic pipe and initial CWA/TIC measurements are taken. When running at periscope depth, CWA/TIC measurements can be performed continuously on the outside air. Depending on the configuration, air samples can be drawn either from the telescopic pipe or from the snorkel. Bruker IMS-based detection systems, including RAID-M 100, RAID-AFM and RAID-S2NC are perfectly suited to compliment these processes.Our handheld RAID-M 100 makes the search for leaks of toxic materials and chemicals simple and provides instantaneous and accurate detection results. Our stationary instruments, RAID-AFM and RAID-S2 NC are perfect for monitoring environments where chemical and combined chemical/radiological hazards are of concern. We have also developed a commercially-available DMS (Dimethyl-sulphate) detector and identification system that is a lightweight, battery powered device. This hand-held detector is capable of finding a target substance at 300 times below the OSHA exposure limit of 1 ppm. All of our equipment can be used stand alone or in an array and merged with existing networks. Bruker also offers bespoke systems specifically tailored to meet the customer’s needs and a consulting service that can be engaged when projects are planned. Please contact Bruker to establish how your project can benefit from our capability.